With all the political unrest here in Wisconsin over the past ten days, and even prior to that, with the last few election cycles, I’ve been thinking a lot about compassion and reflecting on a talk I went to last year by Jeremy Rifkin. “Empathy is the invisible hand.” This video does a nice job of summarizing his theory that we, as a species, need to move towards becoming and embracing our empathic nature. As February closes its blustery doors, we’ve been to two shows, Ben Folds at the Overture in January and Tennis at the High Noon this week. One show was all reality tv tie-ins and piano destruction and the other was all indie kids and understated sounds. I enjoyed them both a ton and am so excited to continue the reintroduction. In other around the town happenings, I got to be a food critic for a night, when I joined Madison A to Z at Los Gemelos for some darn good Mexican fare. Read the review Reviewing food is tricky, subjective and can be easily influenced by good company but it is sure fun to sit around and talk about food. Finally, while the whole state protested this past weekend, I entertained out-of-town guests with great local food and a zoo trip with close tiger encounters and sparring giraffes. I pretended to be on vacation with friends who actually were and found distraction from the politics. For years I’ve admired these simple glass “vases” from CB2 but being practical and trying to be frugal, I never bought them for myself. This Christmas they were under the tree, complete with flowering air plants and a little dirt for grounding, all from SB. We talked about where and how to hang them and I learned that air plants, Epiphytes, don’t like direct sunlight. Not only do they not need dirt or very much water, they don’t want too much sun either. They define low maintenance. My birthday is a week before Valentine’s Day, so I’ve long associated hearts, pink and lace with the good feelings of celebrating another year. This year, when the Paper Source catalog arrived with these fantastic heart valentines on the front, I knew I needed to incorporate some mustache and hat wearing hearts into my birthday. Thanks to some great crafting and baking help from my mother, we created a hat wearing heart cake. The cake was a black magic chocolate cake, with raspberry jelly layers and a cream cheese frosting. The hats and mustaches were made from black fondant and the red frosting was made from mixing some of the raspberry filling with the cream frosting. The eyes and eyebrows are “glitter” gel from a tube. I used a heart cookie cutter to mark the outlines of the hearts. 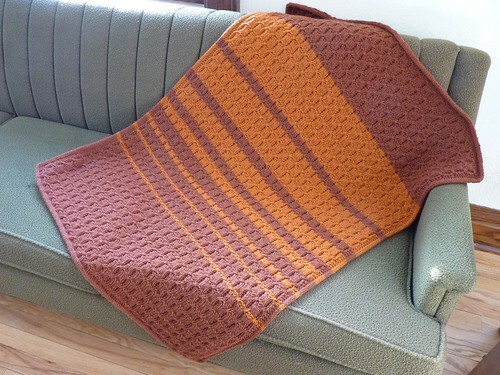 In the great blanket challenge of 2011, this is blanket number two. Wooo! I really enjoyed working off this pattern from Knit Picks. The instructions all made sense and it had this very smart i-cord edge, which, now complete, looks like a seamless cord running around the whole edge of the blanket. I also like how the front and back are equally appealing, yet different. This blanket took me four weeks and came out the same week as the baby. The next one is due a week from now, so I’m going to be a little behind the baby curve for probably the next three babies.